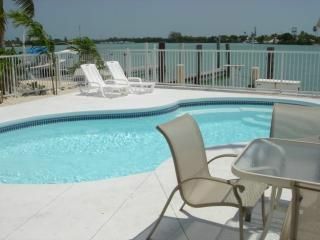 Key Colony duplex, 1/1, AVAIL, we also have the cheapest boats in town! Duplex 1/1. Sleeps up to 4 people. and the occasional dolphin or manatee. Pool, Dishwashers, Washer and Dryer, Grill, 1bd 1bth has King CHECK IN IS AT 3 PM, CHECKOUT IS AT 10 AM. The key will be in the dropbox at 3pm until you pick it up outside our office at 12240 Overseas Hwy right next to the visitors center. Was very nice for the 2 of us. Pool was great, good location. First impression was not good and it took away from the overall stay. Too many small things that left us cold. Broken blinds, no heat working on cold night, sat on edge of bed and almost fell off, thick dust on lamps, received a shock on sink while touching dishwasher, thick dust on air filter, shoddy electrical outlets. Good parts were heated pool and deck, comfortable sofas, newer kitchen cabinets and appliances, washer and dryer, close proximity to everyhing, but tight parking on extremely busy street. Good walking trail across the busy street. Owner sent someone to fix electrical issue and they replaced blinds which made a big difference but left lots of dust and it was day before we left. Lots of potential for the price but needs to be taken care of better. Neighbors in our duplex felt the same and had their own issues. Won’t come back. Thanks for your review, when you called we had someone out the next day to address issues. The blinds were even replaced, the heat did work, they tried it out when they came to fix other things. One thing you had a complaint about was not being able to access the middle door, that door went to the other side where there were renters. Sorry you were disappointed, we did our best to fix any petty issues you complained about. Good luck in your next rental. Will definitely return when the time is right. Convenient location with a nice pool!!! The home is in a great location. You can be to Key West in an hour or to Islamorada in 30 minutes. I stayed at this property last week. Location is great, close to resturants, etc. Best location to visit the whole keys. If you have a boat you'll have your own dock in protected waters. Heated pool. Everything works; appliances appear new. Very nice tiled bathroom, big bedroom. Be aware that this is a duplex, and, as shown in the pictures, the area around the pool is common to both sides. This place has been here awhile, and not everything is "perfect." If you are bothered because concrete is cracked or a shade is old, maybe this isn't the place for you. For me, that is part of the charm. No problems with owner interaction. Fishing, Diving, Pool, Beach, Boating, Tanning, Keys Fun. Weekly Rate: $750 - 1000 1bd 1bth 750/wk, 1500/wk with v-22 Whaler w/200 Yamaha included Multiple week and unit rates, slow season rates. Fall Rates, 650/wk for 1bd Boats available without the house, best rates in Marathon. Christmas rates are 1000/wk plus cleaning and tax for the 1/1. New Years are 1000wk. Rates are subject to change at anytime upon owner request.